Interview with Dacher Keltner, Ph.D.
Home Positive Psychology and Coaching Interviews Interview with Dacher Keltner, Ph.D.
On April 29, 2011, we had a wonderful interview with extraordinary psychologist, Dacher Keltner, Ph.D., author of Born to Be Good: The Science of a Meaningful Life. 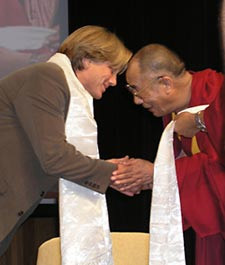 Dacher Keltner is an extraordinary, renowned professor of psychology at UC Berkeley whose research focuses on two time-honored questions. A first is the biological and evolutionary origins of human emotion, with a special concentration on compassion, awe, love, and beauty, and how emotions shape all kinds of judgments. A second is the study of power, status and social class, and the nature of moral intuitions. Dacher [pronounced “dakker”] is the co-author of two best-selling textbooks, one on human emotion, the other on social psychology, as well as Born to Be Good: The Science of a Meaningful Life, published in 2009 by WW Norton Publishers, and The Compassionate Instinct, published by WW Norton in 2010. Dacher is the co-founding faculty director of UC Berkeley’s Greater Good Science Center, which has been at the forefront of the positive psychology movement, making discoveries about how and why people do good. The center translates the science of goodness into action and is unique in its commitment to both science and practice. It publishes its findings with essays on forgiveness, moral inspiration, and everyday ethics in Greater Good magazine. For articles, videos, podcasts, and to sign up for the free bi-monthly newsletter, visit the Greater Good’s website. Dacher has published over 120 scientific articles, he has written for the New York Times Magazine, The London Times, and Utne Reader, and has received numerous national prizes and grants for his research. His research has been covered in Time, Newsweek, the New York Times, the BBC, CNN, NPR, and in many other outlets. For his teaching and mentoring, Dacher was selected as the Outstanding Undergraduate Research Mentor in 2002, and the Outstanding Teacher, Division of Social Sciences, in 2002. Wired magazine recently rated Dacher’s podcasts from his course “Emotion” as one of the five best educational downloads, and the Utne Reader selected Dacher for one of its fifty 2008 visionaries. Dacher received his BA in Psychology and Sociology from UC Santa Barbara in 1984 and his PhD in Social Psychology from Stanford University in 1989. After a post-doc at UCSF with Paul Ekman, in 1992 he took his first academic job, at the University of Wisconsin-Madison, and then returned to Berkeley’s Psychology Department in 1996, where he is now a full professor. Dacher lives in Berkeley with his wife and their two daughters.